Q & A with Mark Sullivan, Author of Beneath a Scarlet Sky. 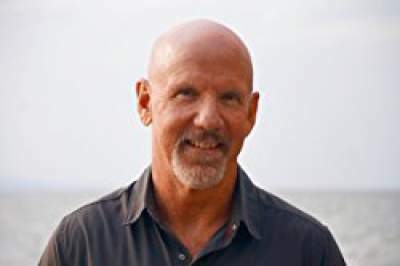 Conversation with Mark Sullivan, author of Beneath a Scarlet Sky, released May 1st, 2017, published by Lake Union Publishing, 524 pages in paperback. Nearly half a million people were killed in the Nazi occupation of Italy during World War II. But among those staggering losses, an incredible number of the most persecuted—some 40,000 Italian Jews—made it out of the war alive. Some survived the death camps. Others evaded arrest. Still others fled, some of them aided by the efforts of everyday Italians who risked their lives to save their fellow countrymen. So many lives and so much sacrifice—and still, so little has been written about what happened in Italy that historians now call it “The Forgotten Front” of WWII. 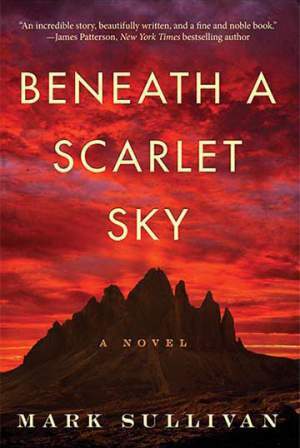 But all that is about to change.Based on the true story of the unlikeliest of heroes, BENEATH A SCARLET SKY is #1 New York Times bestselling author Mark Sullivan’s riveting new tale of extraordinary courage and tragic star-crossed love during the Nazi occupation of Italy. It follows 17-year-old, real-life hero Pino Lella as he helps lead countless Jews out of northern Italy along an underground railroad through the Alps. The saga continues when Pino is then recruited to become a spy for the Italian Resistance. Working undercover as a driver for the head of the Nazi High Command in Italy, Pino gains access to some of the most powerful men in Germany but also witnesses the atrocities of the war firsthand. Q: A self-described adventure nut, you’ve said you’re attracted to stories where characters are pushed to their limits and Pino Lella, the hero of BENEATH A SCARLET SKY, is definitely one of these characters. He risked his life guiding Jews across the Alps into neutral Switzerland, then became a spy inside the German High Command. The unlikeliest of heroes, he witnessed unspeakable atrocities that pushed him to his limits. What made him able to do this? What set him apart from so many other people at that time? A: I am interested in heroes who are pushed to their limits, forced to go beyond themselves, and Pino is certainly one of them. After spending 11 years with this story, I came to believe that Pino was able to survive all these incredible situations because of his basic decency, his gratitude, and his love of life; because of his deep emotional intelligence; and due to his fundamental belief in the miracle of every moment, even the darkest ones, and in the promise of a better tomorrow, even when that promise was not warranted. That philosophy enabled Pino to go beyond who he was, to be selfless in moments of crisis. He conquered the dangers in the winter Alps by focusing on the people he was saving, their emotions and longings. As a spy I think he believed overwhelmingly in the value of his mission, and he felt compelled to bear witness to the atrocities committed by Nazis in Italy. Pino was also extraordinarily young, and like any brash young man he rarely seemed to let doubt cloud his thinking, high in the Alps, or down in Milan in the presence of General Leyers. And, of course, Anna gave him strength. Q: When you first talked to Pino in real life, he was reluctant to tell his story, believing he was more a coward than a hero. Yet, you convinced him to talk and ended up going to hear the story in Italy. Tell us about that. A: The first time I called him from the States, he said he didn’t understand why I’d be interested in him. I told him that from what I knew of his story he was an uncommon hero. His voice changed and he told me he was more a coward than a hero. That only intrigued me more, and after several more calls he agreed to my coming to Italy to hear the story in person and in full. When I first went to see him I stayed for three weeks. We talked for hours, which turned into days and weeks as I listened to him summon up the past. But by the time I got to Pino, more than six decades had passed. Memories change and fade with time. And a tortured mind will block out traumatic events, bury them in the subconscious, or shade them so the victim can look at them from a tremendous distance, and with little emotion. He was evasive at times. He had a self-deprecating nature and often downplayed his role and the dangers he faced. I often had to press him to just describe what happened versus filtering it through the meanings. Then the deeper story began to surface. We laughed. We cried. We became friends. It ended up being one of the most emotional and rewarding experiences of my life. Q: You have a background as an investigative journalist for both newspaper and magazines, why didn’t you tell this story as straight narrative non-fiction? A: That was the original intent, but after years of trying to dig up the documented, fully-corroborated story, I threw up my hands. So many other characters had died before I heard about Pino Lella, and the Nazis had burned so many documents surrounding his story that even after ten years of research I had to make informed assumptions in the narrative. Once I surrendered to that, I knew I was in the realm of historical fiction and writing a novel. I gave in to it and adjusted by switching obligations. The obligations of the non-fiction writer and the novelists are different. The former must hew to the documented facts and eye-witness accounts. The latter should dig for a deeper, emotional truth. I went in that direction, and am glad I did. Q: Tell us about your friendship and what Pino has meant to you. A: January of 2006 was a terrible time for me. My brother had drunk himself to death the prior June. My mother had drunk herself into brain damage. I’d written a book no one liked and was involved in a lingering business dispute. That day I realized darkly that my insurance policies were more valuable than my life and potential in the future. During a snow storm, I seriously considered driving into a bridge abutment on an interstate freeway near my home, but I was saved by thoughts of my wife and sons. I was as shaken as I’ve ever been, and did indeed pray for a story. Over the course of learning about Pino’s story, and as Pino opened up more and more during our conversations, I experienced his deep pain and marveled at his ability to go on after being so depressed and traumatized (he too had contemplated suicide). I had to comfort him repeatedly during the course of his long recounting, and I was moved again and again. During that time, and apart from the details of his war story, Pino taught me about life and his values and the many, many joys he’d been blessed with after handing over General Leyers to U.S. paratroopers on the last day of the war. It made me realize how much I’d put in jeopardy even thinking about suicide. I had a great, loving wife, and two remarkable sons. I had an amazing story to tell. I had a new and dear friend. I was more than lucky. Leaving Italy that first time, I felt blessed to be alive. I went home a different person, grateful for every moment, no matter how flawed, and determined to honor and tell Pino’s story to as many people as possible. I just never thought it would take as long as it did. Q: You spent almost nine years researching this story, hampered, in part, by a kind of collective amnesia concerning Italy and Italians during WWII, and the widespread burning of Nazi documents as the war ground to a close. The Nazi occupation of Italy and the underground railroad formed to save the Italian Jews have received little attention. Why have historians taken to calling Italy “The Forgotten Front”? A: It did take me an awful a long time to dig up the details that surrounded Pino’s story. Over the years and between projects, I spent weeks in the Nazi War Archives in Berlin and Friedrichsburg, Germany, and in the U.S. Archives in Maryland. I went back to Italy two more times, and to Germany a second and third time. All along the way, I was hampered by the burning of Nazi documents in the last days of the war, especially by Organization Todt. I also think historians have tended to ignore Italy because General Eisenhower decided to pull multiple divisions out of Italy in the late spring of 1944 to bolster the fight for France. After liberating Rome in June of that year, the progress of the weakened Allied forces remaining in Italy ground to a virtual halt. And the focus of journalists, historians, and novelists largely turned to the drama of D-Day and its aftermath. Q: Why didn’t Pino Lella talk about his experiences for more than 60 years? Is that unusual? A: It’s not unusual. As I researched the book I found that heroes and tragic victims of the Italian battlefront were commonplace, and often intentionally unheralded or un-mourned. Pino and many, many others who survived the war in Italy blocked out their experiences. They witnessed men and women at their most noble and at their most savage. They rose to challenge after challenge, responded, and in victory and in tragedy promptly buried their memories and told no one. In my experience, older Italians don’t talk freely about the war. To younger generations it’s as if it never happened. One old partisan fighter I interviewed told me that when he reluctantly went to a high school in Milan recently at the request of a history teacher to talk about the war, the students laughed at him. They said the things he’d seen could never have happened. Q: You’ve said that global bestselling author James Patterson, your co-author on the Private series, “gave you a master class in commercial fiction.” What are some of the lessons he taught you, and how have they changed your writing life? A: Mr. Patterson did give me a master class in commercial fiction. I’d written 10 novels before he asked me to collaborate with him, and I thought I knew what I was doing. I didn’t. Not really. For the most part I’d winged it in my earlier works of fiction, writing draft after draft before the real story appeared. Patterson believed in thinking out the plot up front, that novel writing is like house building—you have to be an architect first and design the layout and frame before you start thinking about anything else. Patterson also taught me that we were entertainers, not educators, and that our stories were driven by suspense and mystery but focused on emotion. He really hammered that into me, and I think my writing’s improved vastly because of it. Get your copy of Beneath a Scarlet Sky here. Wonderful interview! I love how in depth all of your questions are. I definitely need to add his book to my TBR! Wow…such commitment to developing this book and devotion to explaining and sharing the amazing heroics of an honorable man. It seems like the next step should be turning it into a movie. Well done! Interesting read! Thanks for sharing. Wow, this sounds like a really interesting book. How very true, we don’t hear Italy mentioned quite as prominently when we talk about the war and the Nazis. I find this “collective amnesia” to be of particular interest. Such an interesting interview! True, little is said about Italy which is why this book is extra special.